The radiological hazard indices were determined using NaI(Tl) detector for twenty six collected rock samples from Abu Rusheid area, South Eastern Desert, Egypt. 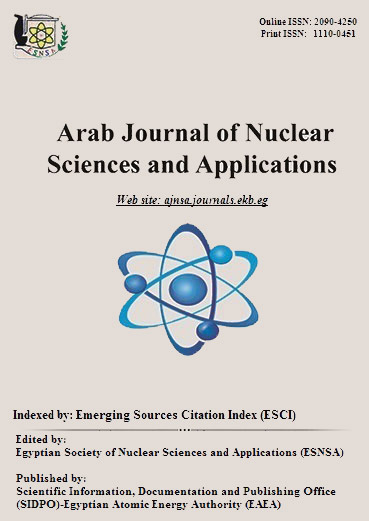 The Eastern Desert of Egypt is a source of granitic rocks used for uranium mining and also used as raw materials for building, for that reason cataclastic (mylonitic) rock samlpes were investigated to evaluate the radiation hazard indicators and compare the values of the world average values.The results show that, the distribution of radionuclides activity concentrations in the rock sample varieties affects the values of the absorbed dose rate in the studied rocks to be higher than the worldwide limit that are not safe for human. The average values of the total annual effective dose varied from 3.30 to 7.51 mSvy-1 and the lifetime cancer risk ranged from 2.31to 5.25. From the radiation protection point, the results were found above the worldwide average. These data record the radioactivity background levels in rock samples and could be used as reference information to assess any changes in the radioactivity background level due to different geological processes in the investigated area.